including 6 world records and 6 Hawaii state records ! I could easily make Kona’s “Big Fish List” every year with one of these. I catch more amberjack than any other captain in Kona and some of them are even bigger than this one but I always release them. Well, almost always. Some of them come in so weak after the fight that they just can’t swim anymore and they just float on the surface. I tried several of my proven methods to revive this one but none of them worked. This one weighed in at 75.5 lbs. 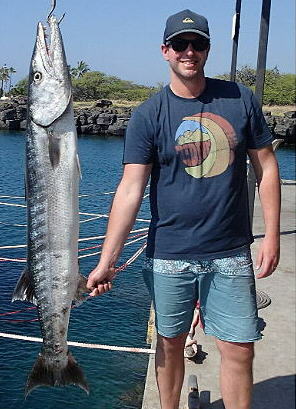 Barracuda are a fairly rare catch off of the Kona coast. They’re not generally fast enough to catch a trolled lure but occasionally they do manage to get one and they are generally small in size. While bottom fishing, I’ve had them hit my baits on the way to the bottom near the surface but in all the years I’ve been bottom fishing, this is the first time ever that I’ve caught one right on the bottom. It was about 400 feet deep. It’s also the biggest I’ve ever seen so I decided to take it in and weigh it. At 39 lbs. it made Kona’s “Big Fish List” and at that size, it most likely won’t be beat in 2017. January isn’t mahi mahi season but as I explain on my Fishing Season Calendar, we can catch any fish in any season here. We got a double mahi mahi hook up right out of the harbor. I didn’t even get the chance to instuct Allen Murray and Bruce Hardy on the use of big game reels yet so the instructions had to be made while actually pulling in fish. We landed the first one and it was a typical size of 15 lbs. The 2nd one was obviously bigger and weighed in at 34.5 lbs. and with that weight, it makes Kona’s “Big Fish List”. It’s a big one but when mahi mahi season gets here, it will probably be beaten. Bigger than average but not REAL big. At 56 lbs., this amberjack makes Kona’s “Big Fish List” because the amberjack category was still vacant 5 months into the year. 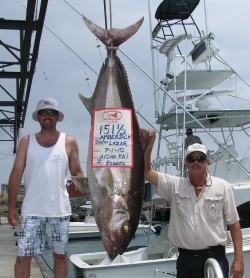 Amberjack are caught while bottom fishing and very few captains do that. I’ve tagged and released several amberjacks so far this year and I tagged and attempted to release this one also but it just wouldn’t swim. I suspect it had some major internal injuries from rapid decompression. The bigger the fish, the bigger the swim bladder, the more air volume, the harder to release. But, it gets my name on the list for the 3rd time this year. I let most of the giant trevally’s go but you will see several furhter down this page. That’s because they fight so hard that they don’t survive the fight. This 100.5 pounder came in all blown up like a baloon and bleeding badly. This beast had won many fights in the past as was evident from all the battle scars. It’s top front lip had been torn half off and had healed up but remained unattached at the corner of the jaw. The angler, Michael Ragas had no idea that what he caught was such a big deal. 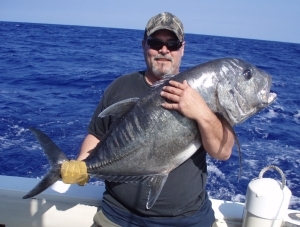 Not only did it make Kona’s “Big Fish List” but just like landing a 1000+ “grander” marlin, the magic number to make the record books for the giant trevally (GT) is 100+ lbs. The day wasn’t going well. I went to the bait fish spots but couldn’t find any. Trolling wasn’t producing anything either. Brian Riddle had brought his friend Richard Greger from California because he said I was such a good fisherman. Brian fished with me several days last year and we had both good and not so good trips so he knows that sometimes it can be hard to find ’em. I decided to go do some bottom jigging so we could at least get some kind of action. It worked and Richard and Brian each caught and released almaco jacks. On the troll back to the harbor we hooked this striped marlin on light stand-up tackle. Richard took the rod and had his hands full. I had planed on rleaseing it but when it got to the boat, I noticed that the hook had popped it’s eye ball so we took it. 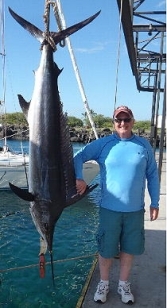 At 97.5 lbs., this striped marlin takes the lead on Kona’s “Big Fish List” and certainly made for a better fishing day. It’s early in the year but 100+ lb. striped marlin are rare in Hawaii so even though it’s a little under the 100 mark, it might stand as the biggest for a while. Arjen Waldus makes my Hall of Fame page again! He has fished with me many times over the years even though he has to make a very long flight all the way from Holland to get to Kona. 3+ years ago Arjen was injured while fighting a 200 lb. tuna on spinning tackle (not with me) and tore out both of his shoulders so after an operation and physical therapy, this trip was his return to big game fishing debut. Giant trevally (GT) are one of the hardest fighting fish on the planet and I’m glad Arjen’s shoulders didn’t get torn out again. We could have killed this GT and made the “Big Fish List” but we opted to release it instead. The biggest GT on the list so far this year is only 74 lbs. and this one is easily over the 100 lb. mark. Estimate is somewhere between 120 – 125 lbs. We still made the West Hawaii Today newspaper with this catch though because 100+ pounders are rare and the photo (in the newspaper also) easily shows what a beast this is. I’m glad we released this big breeder. When Tom McKelvey caught this very large ono, I thought we had a shot at making Kona’s Big Fish List with it so we took it to the scales for the weigh in. It turned out that we were just a few pounds shy for the biggest of the year. Still not a bad day of fishing with the catch and release of a spearfish and a gray snapper caught while bottom fishing but then I found out that the gray snapper slot on the Big Fish List was vacant so I submitted it and Tom ended up on the big list with his snapper. 2000 tagged and released fish; When I started targeting bottom fish instead of just trolling for top water fish all day, it changed my whole attitude about Kona fishing. The bottom fish were more cooperative and I could go to areas where I knew we would catch some good size fish. Some of the most common fish I catch while doing this belong to the family of fish called “jacks”. I helped implement a state wide tag and release program for them and within a few years, the science learned from this was shocking. Migration patterns that no one could even have imagined and the fact that they sometimes travel long distances throughout the Hawaiian island chain to name just a few. 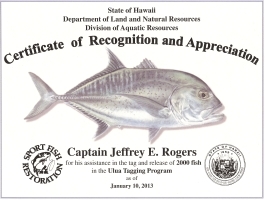 Since the programs inception, I have tagged and released more fish each year than any other captain in the whole state. It was a long and hard fight for Travis Hansley and while I normally tag and release this kind of fish, this GT (giant trevally) was just too tired after the fight to swim away so we took it in and weighed it. There was no doubt that it would make Kona’s “Big Fish List” with a weight of 95 lbs. and although the fame of a catch like this is nice, Travis and I both would have rather see it swim away. I’ve already tagged and released a few bigger GT’s than this in 2011. It soon became apparent that the pull from the fish was too much for the angler who was attempting to fight it. I (Capt. Jeff on the right) took over the stand-up fight while Jason Lazar (left) got a fighting belt on and took over the fight. He had the strength and techniqe that it took to finish the fight. I almost couldn’t believe my eyes when I saw this fish pop to the surface. As I pulled it in the boat I said “This one might go a hundread and a half” and I wasn’t far off. At 151.5 lbs. this is the new Hawaii State Record Amberjack. While it wouldn’t have qualified for a world record because more than on alngler fought the fish, it’s just 3.5 lbs. shy of of the current world record. Giant Trevally, also known simply as GT are one of the most prized catches of the Pacific and no charter captain in Kona catches more of these each year than I do. Pound for pound they are one of the toughest fighting fish you’ll ever hook into. After tagging, most of these fish are able to swim away but once in a while, they fight so hard that they use every bit of strength and are unable to swim after the fight. We tried for a long time to get this one released but it just wouldn’t go. As the first GT weighed in for the year, it made Kona’s “Big Fish List”. There was also an interesting part of the story as to the location that Ezer Matthews caught this fish and the story was featured in the local paper as a result. Too long to go into detail here but I keep a big scrap book on the Aloha Kai with many of the publicized catches seen on this page plus a whole bunch more. Normally I release the blue marlin but once in a while they die during the fight as this one did. When a big fish goes deep and dies, the only way to get it back to the surface is to hand line it up along with planing it up using the boat. Roland Metivier and I were the only two on the Aloha Kai this day but the seas were calm and we got the job done in short time. This was the biggest marlin brought in so far this year and made Kona’s “Big Fish List”and added to that, A marlin over 500 lbs. is called a “Beast” so this was also the first “Beast” marlin caught for the year. It made the local paper and also Hawaii Fishing News. My good friend Arjen Waldus comes all the way to Kona from Holland to fish with me every year. We have had many wonderful adventures to include a “grander” tiger shark and he’s also the guy doing the stand-up marlin fight in the video featured on “The Boats” page. 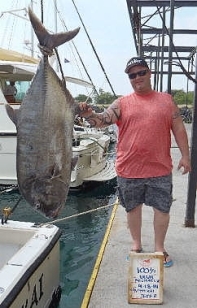 This year Arjen made Kona’s “Big Fish List” by catching the biggest skipjack tuna, locally called otaru or otado, weighing in at a whopping 32 lbs. It’s the biggest one I’ve ever seen and to make things even more fun, Arjen caught it on a light stand-up outfit that he brought with him from Holland. 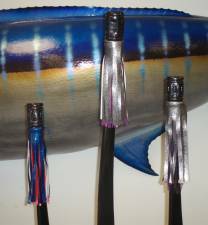 Marlin Magazine featured these lures that I designed and build in their May 2009 issue. I make these from plastic 12 oz. Gatorade bottles and 10 oz. juice bottles. I give the bottle color using rubberized tool handle dip as regular paint has a tendency to chip off. It’s very important to drill the bottom of the bottle directly in the center so they run straight. I use naugahyde for the two skirts on the 12 oz. version as there are two indentations on the standard 12 oz. bottle to tie them on to. On the 10 oz. version, there is only one indentation to tie on a naugahyde skirt on so I use a standard skirt around the bottle neck. To “juice” things up a bit, use the cap with holes drilled in it and you can stuff these bottles full of anchovies so they leave a bait scent as they go. Touted as the worlds ugliest marlin, this is indeed one of the most unusual marlin I’ve ever seen. When we hooked this marlin on 80 lb. tackle and I saw it jump, I rightly estimated the weight at about 250 lbs. I was then amazed as the marlin nearly spooled me on it’s first run and I had to turn and chase the fish with the boat. The marlin made another long and powerful run later in the fight. It didn’t make sense to me that a fish of that size was that powerful. When it jumped right behind the boat I realized there was something else odd about this marlin. As you can see, the bill is bent backwards and growing tight against the head. This injury must have happened when the fish was VERY young, otherwise the bill would have just broken off. The two tusks formed by the upper jaw was interesting too. I released the fish to fight another day. I figure, if you’re the ugliest kid in school you need to fight harder and run faster than anyone else. I guess the same holds true if you’re the ugliest marlin in the ocean. 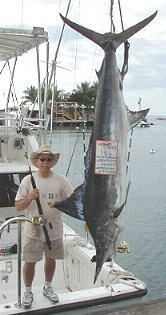 A “Grander” marlin is the hope of every captain in Kona. A combination of skill and luck are needed to accomplish the task and this was no different. I was fortunate enough to be on the “Intrepid” this day with an excellent co-captain running the deck, Capt. Rick Reager. We had just started our day and hooked the beast less than 3 miles from the harbor. Ricky and I both knew she was a big one but both of us underestimated how big she really was. It was a 3 hour fight on 130 lb. test for angler Matt Prater to finally bring her in. I looked at the tired angler and the hurting Capt. Rick (wrapping leader on a huge fish hurts!) and claimed “Now the hard part starts”! It’s been my experience with other huge fish (none this big) that it can be as much work trying to get the fish in the boat as it can be catching it. Little did I know that this would be a “tug-O-war”. Just as we were trying to pull her in the boat, 3 white tip sharks showed up and started tearing out chunks of fish. The urgency to get her through the transom door became frantic but the sharks kept pulling her away from us. I told Capt. Rick to put his rope around the fighting chair and cleat it off. “Get on the bridge and get us out of here”! Capt. Rick did so quickly and it’s a good thing. The amount of fish you see missing is at least 150 lbs. and the other side is almost as bad. All that damage was done in about 1 minute. I figure we were about 15 to 20 seconds away from being the sad, “almost a Grander” story. The Angler, Matt Prater seems to be a talented writer besides a Grander angler. He wrote his story about the day in my [ Guest Book ]. Matt’s entry date is April 09, 2008. I made Kona’s “Big Fish List” earlier this year with a big giant trevally (GT) caught in January. The benchmark for a super trophy GT is when they reach over 100 lbs. I always said that if one of my anglers ever got a 100+ pounder that I would kill it for the publicity. Well, it’s taken nearly 11 years to get a 100+ and Khang Le from Australia was the angler. I just didn’t have the heart to kill it. Khang wasn’t too thrilled about the idea either. Normally the bigger GT come in half dead but this fish came in strong and ticked off ! After a tag and a quick photo, it swam away strong. A conservative estimate of it’s weight is 110+ but how much over is a guess. 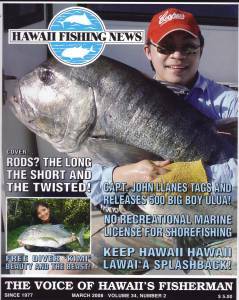 It got publicized anyway (with photo) in Kona’s West Hawaii Today newspaper and also made the cover of Hawaii Fishing News. 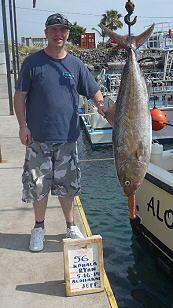 Amberjack is just one of the many big game fish you can catch while bottom fishing here in Kona. The average size of the amberjack we catch is closer to 40 pounds but every year I get several bigger ones and even a few that top the 100 pound mark. 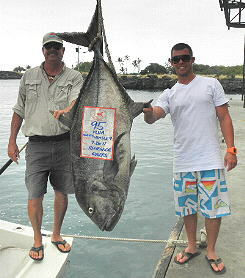 This 122 pounder made Kona’s “Big Fish List” and was brought in by angler Scott Brooks from Fort Mill S.C. Giant Trevally, also simply called GT are one of the most prized fighting fish in the Western Pacific. They make big runs and do a lot of head shaking. This 86 1/2 lb. fish was caught on a jig with a father and son team effort. Chris Pinedo fought the fish for 20 minutes before he had enough. His son Danny took over and after another 30 minutes of fighting we got the fish. The hook was barely in the fish but the jig was wedged in it’s throat. The hook tip was under the chin and not even as deep as the barb but it was enough pressure to keep the jig from being spit out. 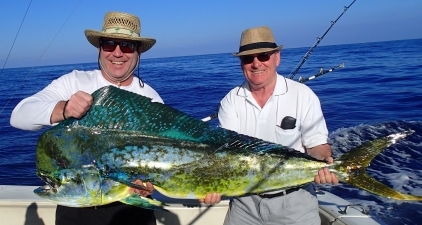 This fish made Kona’s “Big Fish List” . This 131 lb. 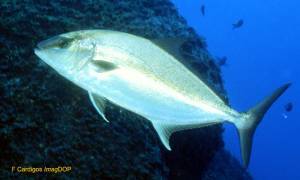 amberjack is the biggest amberjack caught in Hawaii since the new state record of 145 lbs. was caught in ’02. Randy Russell of Spokane WA. angled this beast on stand-up tackle. Of course it made Kona’s “Big Fish List” and will most likely stay there for the whole year. It took me over a year to prove to the State of Hawaii DAR that I was catching almaco jack (seriola rivoliana) in Hawaiian waters. My discovery was made official on April 4th 2002 when the “world authority on carangid fishes”, Dr. William F. Smith-Vaniz confirmed my findings from photographs I sent to him. This was after Hawaii ichthyologists examined actual specimens I sent to them in Honolulu and they claimed I was mistaken. The controversy about this fish arose again in Oct. ’05 when A local company started farm raising almaco jack for consumption under the name “Kona Kampachi” in offshore pens here. They were soon accused of introducing a new species prompting an article in the West Hawaii Today newspaper clearing up the confusion and making my discovery public. 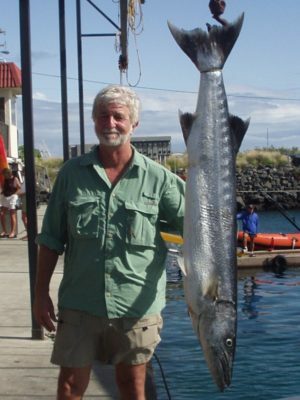 I now hold 3 places on Kona’s “Big Fish List”. Tony Watson caught this 21 1/2 lb. gray snapper. While it’s not a huge one, it could stay on the list all year. 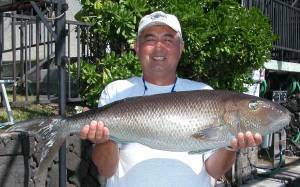 WOW, another fish making “Big Fish List”in just a few days. Barracuda are a fairly rare catch here and the big ones are even more rare. Mike Ingratta caught this and it weighed in at 43 1/2 lbs. Ed McVinney caught this 85 lb. 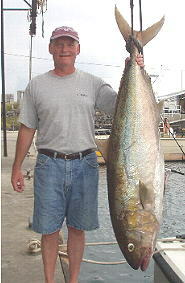 amberjack making Kona’s “Big Fish List”. I easily catch the biggest of the year almost every year but usually I release them instead of going for the publicity. 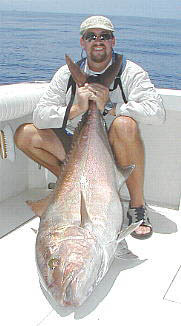 The big ones fight hard and sometimes to the death so weighing them in at taht point is OK.
Amberjack is a fish that I often catch while bottom fishing (see my fish photos page). JP Lapeyre caught this 105 pounder on the Penn 30 stand-up tackle that I commonly use for bottom fishing. Each year we catch a few jacks that hit the 100 lb. + range and, if I kill ’em and weigh ’em, they usually make Kona’s “Big Fish List”. Few captains will even target (or even know how to target) the bottom. I usually take some time during each trip to see what’s biting down there. It’s usually a fast bite that produces a wide variety of sharks, amberjack, almaco jack, giant trevally, snapper and grouper. We hooked into this beast just 20 minutes out of the harbor. During the fight the fish charged the boat 3 times. One of those times I had to give the boat full throttle and still just barely out paced the fish as it headed straight up the wake toward us. Bill Pattison did an excellent job angling and had it to the boat in just 2 hours. Right at the back of the boat the hook pulled out of the fish! Quick reactions by Bill’s son getting the lure out of the water so I could back the boat up, some quick maneuvering and I was able to free gaff it before it could get away. 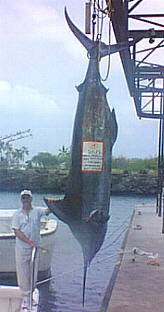 At 851 1/2 lbs, this is (as of 3/28/02)Kona’s 2nd biggest Pacific blue marlin of the year. 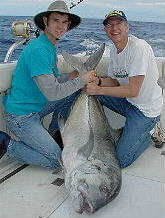 The biggest for the year was caught 1/31/02 and weighed in at 944 lbs. 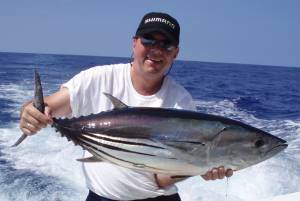 Steve Broderick is an experienced angler. After watching his technique fighting a good size amberjack, I realized that catching a striped marlin with the typical 130 lb. 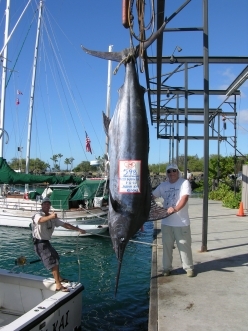 class tackle used in Kona for marlin just wouldn’t be any fun for him. Most of the striped marlin running at this time were only averaging 50 to 60 lbs. anyway. We decided to use the Penn 30 lb. class stand-up tackle to make more fun of the fight. This 186 lb. striped marlin was a bit bigger than we had expected! Steve did an excellent job of angling and he had it to the boat in just 20 minutes. 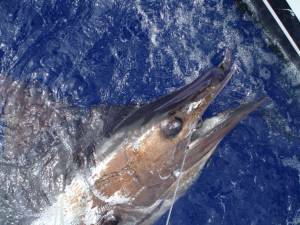 This is the biggest striped marlin caught in Hawaii since 1996 when the state record of 211 lbs. was caught. You may also notice that this fish has a very short bill. It had been broken off in a previous battle (with who knows what). and, as billfish do, was in the process of growing back a new one. A good way to start off the new year! Tatsuya Isa caught this giant trevally (ulua in Hawaiian) while deep jigging with me on 35 lb. test spinning tackle. This is a big one so of course it made Kona’s “Big Fish List” . Maryann Rogers (my daughter) with her 326 lb. Dusky shark that is now the 80 lb. tackle woman’s World record & State record! This is Maryann’s 2nd world record catch. This shark also solves a 30+ year old ichthyologists controversy. This is the first known specimen of Dusky shark ever caught in Hawaiian waters. There is a book called ‘Fishes of Hawaii’ that lists the Dusky as being found in Hawaiian waters. There was never any proof of that claim until now! It took Maryann just over an hour to angle this beast. 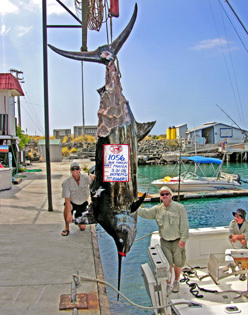 Kona’s largest Black Marlin of this century! 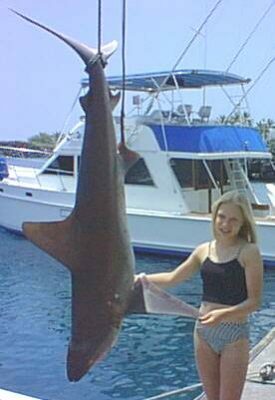 Amanda Rogers (my daughter) with her 130 lb. tackle women’s World record sandbar shark. This is Amanda’s 2nd world record catch. This 91 1/2 lb. beast gave 12 year old Amanda a tough fight. Amanda’s tough herself. She tamed this beast in just 30 minutes. 1st ever Kona Amberjack / Trevally bottom fishing tournament. Five boats entered for 3 days of fishing. 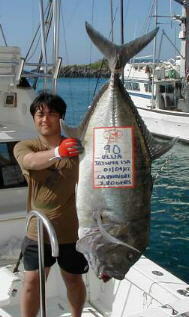 Pictured here is the 1st place winner Oseto Masayuki fishing with me on the K-IX. On the first day he caught and released the 3 biggest Amberjack of the day. By the end of the 2nd day, he was so far ahead in points, he didn’t even have to fish the 3rd day to win the tournament. He did fish the 3rd day though and caught the biggest fish of the whole tournament. 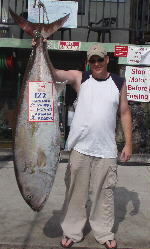 A Trevally of over 70 lbs. Noriyuki Matsushita breaks the old State record for Oriental Bonito (below) with this 10.61 pounder. 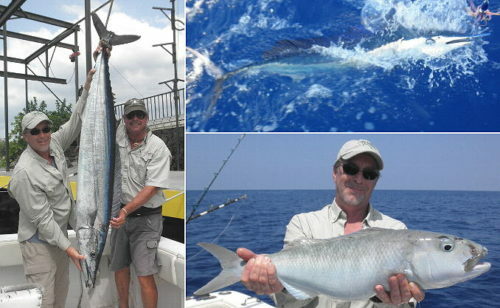 The story and photos of this strange catch (and previous Bonito catches) were published in Western Outdoors magazine. Atsushi Chikada with his 8 pound State record Oriental Bonito. The previous State record of 7 pounds was set just two months earlier on the K-IX after an identification mix-up was clarified. It was not known before these record catches that Oriental bonito inhabited Hawaiian waters. 3 World records in one Day!!! Left to right are Peter Purdy age 7 with his 50 1/2 pound Amberjack – boys small fry division. Maryann Rogers age 15 (my daughter) with her 26 pound Amberjack -girls junior division and Amanda Rogers age 10 (also my daughter) with her 21 pound Amberjack -girls small fry division. Naohiko Nonogaki of Japan and myself with his 23 pound State and World record Randall’s Snapper. The old record was 10 pounds. This fish also made the cover of Hawaii Fishing News, Nov.1997 issue, Western Outdoors magazine Feb. 1998 issue and was also featured in the Penn Reels 1999 spring catalog.